The AARG Gallery Collection - a walk down memory lane In the AARG archives there is a broad range of Amateur Radio related photos, each of which deserves to be readily available to members and other interested site visitors. This Gallery does that and, for ease of viewing, the photos have been grouped into the main areas of club activity. It is understood that, in addition to the pictures featured here, there are many AARG related photographs held by individuals and not in the club archive. 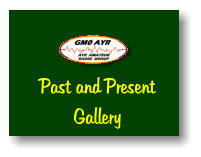 We ask anyone who has any such pictures to submit them to us for inclusion in this gallery – each one adds a part to the archive and helps to provide a concise photographic record of over 80 years of Amateur Radio in Ayr and Ayrshire. If you have any AARG archive photos please contact John, GM0EPO Click on image to see photos on a new page and then click on any photo to start slide show.